LytaScreed is one of the most versatile screed products available to the UK market. Used extensively within the iconic buildings above providing key design benefits throughout. LytaScreed Topped is comprised of a cement bound Lytag 4/8mm lightweight aggregate base coat with associated 15mm sand cement topping installed in a two phase operation. This creates a semi-dry floor screed that is suitable for all sensitive floor coverings in as little as five days and is up to 40% lighter than traditional screeding methods. LytaScreed Topped has no restrictions on use. LytaScreed Base is one of the most versatile screed products available to the UK market. Used extensively within the iconic buildings above providing key design benefits throughout. 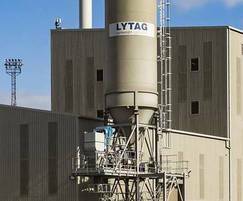 LytaScreed Base is comprised of cement bound Lytag 4/8mm lightweight aggregate, creating a semi-dry floor screed that is suitable for nonsensitive floor coverings in as little as 72 hours, and is up to 50% lighter than traditional screeding methods. LytaScreed Base requires the final floor coverings to be over 14mm thick.